Ernie Lawson was born in Hamilton, Ohio, and graduated from Hamilton High School in 1956. He joined the Air force in 1957 and married Ruby Jane Shelton in December, 1957. After being discharged from the Air Force in 1961 he surrendered to preach in May of the same year. In 1957, Ernie and Ruby enrolled in Eastern Baptist Institute from which he received a Masters Degree. Ernie pastored Saline Baptist church in Somerset, KY, and Grace Baptist Church in Milford, OH. In 1967, he resigned Grace Baptist Church to go to Japan as a missionary, where he and Ruby have served for almost 50 years. During those years he was sponsored by Twinbrook Hills BC of Hamilton - OH, Oaklawn BC of Hot Springs - AR, and Magnolia Springs BC of Theodore - AL. Flatwoods MBC in Mountain View, Arkansas, presently sponsors the Lawson’s work in Japan. Bro. Lawson worked with several missions in Japan and led in organizing two of them into indigenous New Testament Churches. He also worked with Bro. 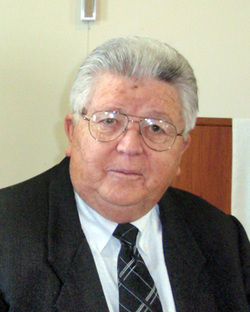 Bennie McWha in establishing the Japan Missionary Baptist Seminary in 1975 and has served as the president of the school from 1978 until the present. He is also serving the Eternal Life Baptist Mission in Ushiku, Japan.